Hi, my name is Alicia and I am a Arizona native. My family and I enjoy all activities the Arizona summer has to offer. We especially like to camp and fish at the White Mountains, hike at Catalina State Park and tube the Salt River. I have worked in all fields of dentistry in the last 10 years. I found my home here at Creative Smiles and have earned 3 promotions in 3 years. I hope to continue to learn, grow, and advance. I have one teenage son who attends Canyon Del Oro High School. He participates in basketball and football. I have 2 small dogs, Duke & Koko, who are my spoiled babies. My name is Jackie and I am a native to Tucson. I like to try new foods and hike with my husband, Tony. We started a tradition starting with our honeymoon in which we went to Turkey, Greece, and Italy, to travel once a year out of the country to experience a different culture. We rescued two dogs, Molly, a pit mix, and Kayla, a lab mix, both in which have a big personality. On my spare time, I like to watch my favorite shows, Game of Thrones and The Bachelor. Hi, my name is Jailenne Montalvo. I was born in Phoenix and have lived in Tucson for the past 14 years with my three brothers and my amazing mother. My favorite hobbies are playing soccer, going to the gym, and being outdoors. I enjoy spending time with my family and friends - making the best out of every moment. I graduated from Amphitheater High School in 2014. My goal after graduating was to become either a hygienist or dentist. Later, I enrolled to Carrington College and decided being a dental assistant would give me a better in look to decide what path I should take. I graduated from Carrington College in 2016 and was hired right after externship. Since then I fell in love with my career and have decided to stay as a dental assistant for the moment to continue learning and growing in the dental field. As a dental assistant, seeing the joy I help bring to patients has been one of the many reasons I continue doing what I do. 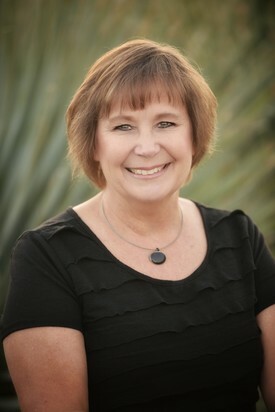 Hi, my name is Laurie aka “La La.” I have been a dental hygienist for 17 years. I have learned so much on this journey. I appreciate everyday and everyone I have met along the way. My patients and my co-workers have enriched my life in ways they will never know. I have learned from patients how to be a better clinician, a good listener and a friend. I enjoy helping people get healthy and stay healthy. I believe in building great relationships and getting to know my patients. I want patients to feel safe and comfortable and to have an enjoyable visit. I am a mother of two. My son is 25 and works for Jim Click. My daughter is 17 and will be starting college in August. They are my biggest and best accomplishment so far. I enjoy hiking, traveling, spending time with the kids, and listening to music. Hi, I’m Kenda Romero! I graduated with my dental hygiene degree in 2003 and received the Proctor and Gamble Award for Outstanding Community Service. My husband and I are both Tucson natives. I have 3 sons, 2 step-daughters and 2 grandsons. Three of our children are on their own but we are blessed that they all still live here in Tucson, AZ. We are super busy with our two youngest boys who are only thirteen months apart and in grade school. They keep us on our toes. I love taking trips to the mountains and enjoy camping and fishing with my family. I love animals and have enjoyed raising dogs, chickens and dairy goats over the years. One of my favorite things about being a dental hygienist is the relationship I form with my patients. I strive to be an excellent clinician and to truly understand the individual needs of each patient. 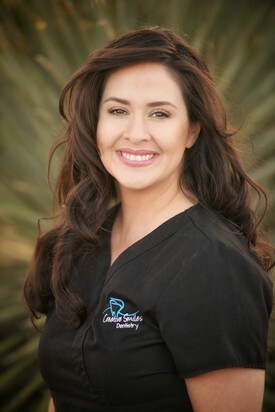 I am truly blessed to have the opportunity to work at Creative Smiles Dentistry and partner with such a great team! Hi, I’m Miranda! I’m proud to be a hygienist as a part of this amazing dental family. I graduated with my dental hygiene degree in 2006 and received the Hu Friedy Golden Scaler award. My work in dental hygiene has been published in peer reviewed journals including Hygienetown and Orthotown. I have worked in dentistry for 18 years. I began working as an orthodontic assistant, then moved towards dental hygiene. Dental hygiene is an ever changing career with all the new technology. That’s the one of the aspect of this career that I enjoy, especially working as an advocate for my patients and sharing the dental education needed for prevention. I have a son that is in high school. When we can, we spend our free time in the outdoors, fishing and camping. 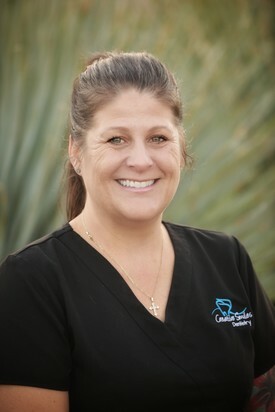 Hello, my name is Penny Pratt and I am a Treatment Coordinator here at Creative Smiles Dentistry. I have 16 years of dental office experience. I have to say it’s GREAT to finally be back home in Tucson after almost 30 years. My husband of 32 years, took our family many places during his 20 years of service in the United States Air Force. After spending time in Japan and Okinawa, we settled in Scott AFB, Illinois where he retired. We have two sons who were actually born here in Tucson. Our oldest son, Cody, his wife Kelly and our two grandsons Henry and Lincoln currently live in Missouri. They will soon be moving on to bigger and better things. Our youngest son, Jake, and his wife Kristen will soon be joining us here in Arizona. For me it’s God and Family. It’s awesome being back home where we are able to reconnect and spend time with our family and friends that live close by. I enjoy the outdoors. I have hiked part of the Appalachian trail and ran a half-marathon. My husband and I just purchased a Polaris RZR and we look forward to hiking and exploring the many trails Arizona has to offer. 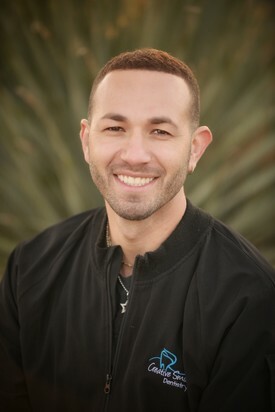 I’m very excited about being a part of Creative Smiles Dentistry! I enjoy working with such a professional patient focused team! I look very forward to serving you! Hi, my name is Samuel “Sammy” Tarazon. I have been a dental assistant since 2011. 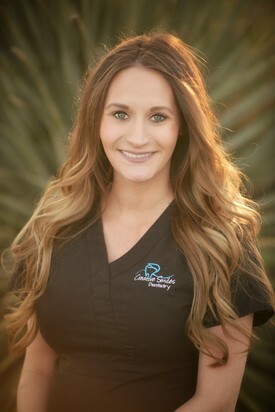 I am amazing at what I do because of my extensive amount of training and experience in the dental field. 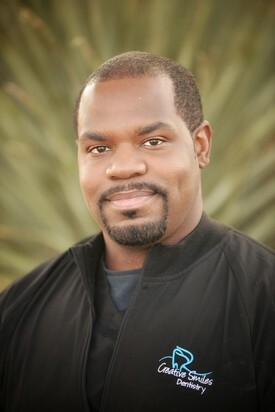 Patients describe me as intelligent, talented, and funny while providing awesome dental care. I was born in Long Beach, California and raised in Tucson, AZ. I love sports, especially basketball, baseball, soccer, and boxing. With my dedication, I exceed becoming the best at any sport I play. I am the youngest of 7 siblings – five brothers and two sisters. I enjoy spending time with both my fiancée and puppy. Together we explore the outdoors and travel. Hi! 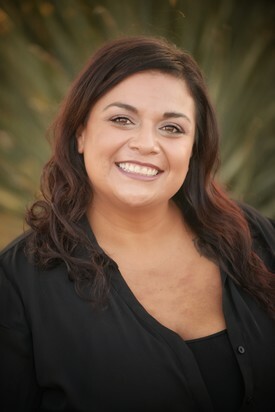 My name is Theresa and I am a treatment coordinator at Creative Smiles. I moved to Tucson, AZ in the spring of 2018. I am originally from San Pedro, CA. I have been in the dental field for about 7 years. I have a large family and am the youngest of three children. I have six nieces and nephews with whom I spend a lot of time. I enjoy just about anything outdoors, watching movies, listening to music and since I am a true artist at heart, anything creative. I am excited to have my life here in Arizona and am so happy to be part of such a wonderful work family! 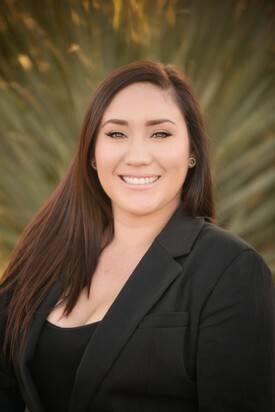 My name is Vanessa and I am the Practice Manager. 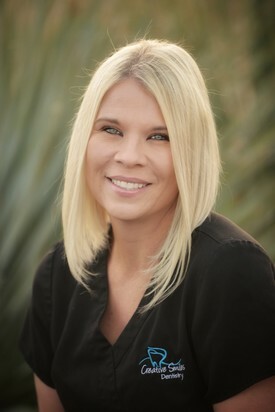 I have over 15 years of experience in the dental field and have enjoyed every minute of it. I recently took a break from dentistry and made a decision to serve our country. Due to an injury during basic training, I came back into the dental field. And, I am so happy to be back home and be a part of this amazing team here at Creative Smiles. I am looking forward to the new adventures to come! I am native to Tucson. I have three wonderful children and cherish every moment with them. I enjoy traveling, listening to music, reading, and catching up on Netflix. My name is Vincent Hampton. I've been a dental assistant since 2010. 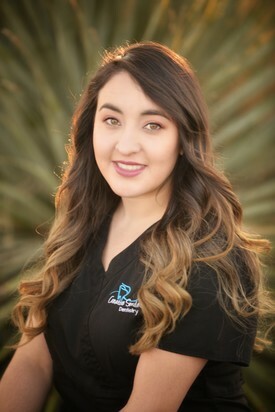 Since I began my career in the dental field, I've worked at many high quality offices learning oral surgery, endodontics, and general dentistry. I was born in California and my family moved to Tucson in 1995, where I have lived ever since. I love football. Every weekend I help coach young athletes in my area. When I'm not at the football field, I enjoy spending time with my family. My parents, brother, 2 sisters and 2 nieces are all still here in Arizona. We are a close family and try to get together at least once a month. Other hobbies of mine are astronomy, writing fantasy fiction, video games, anime and recently I have begun 3D animation. I plan on starting a YouTube channel with my older brother and creating a short animated TV series.